As a Latin American country with an average rate of $0.09 per minute, Ecuador will be a good choice as a destination to terminate voice traffic. 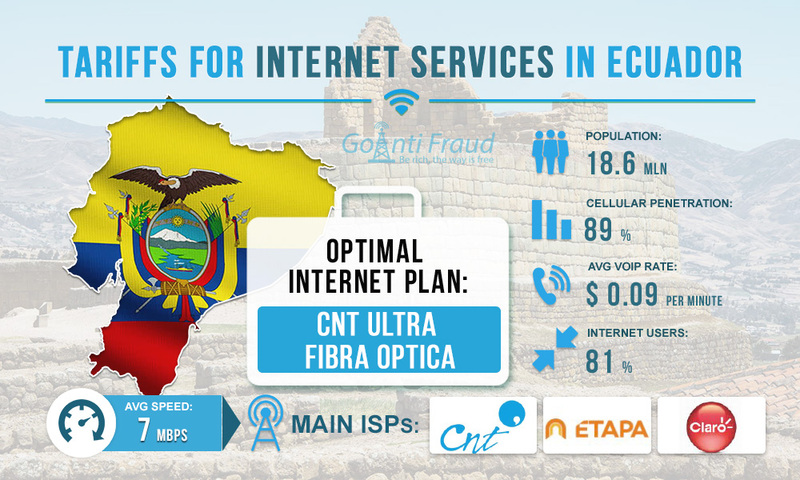 Ecuador has a well-developed mobile sector, with the market of Internet services developing actively. But for a profitable business, it is important to minimize the cost of connecting the Internet. Currently, the penetration rate of the Internet in Ecuador is 81%. The leader in the market is CNT, which is the state-owned provider. Many subscribers also use the services of Etapa and Claro. Broadband Internet is available mainly in cities, with the average download speed being 7 Mbps. Ultra Fibra Optica provides fiber optic connection. Tariffs depend on the download speed. $27 per month - speed up to 15 Mbps; $32 - up to 25 Mbps; $45 - up to 50 Mbps; $ 60 - 75 Mbps; $ 81 - 100 Mbps. Banda Ancha Hogar provides Wi-Fi connection at 4 to 15 Mbps (rates - from $18 to $30, depending on the speed). PLAN RESIDENCIAL. The speed varies from 2.4 to 12 Mbps. The cost is from $20 to $78. RED GPON. There are 3 packages: 5 Megas (25 dollars), 10 Megas (46 dollars), and 16 Megas (64 dollars), with the corresponding speed names. There is a promotional offer: for one year, you can connect the Internet at a speed of 16 Mbps for $24, 30 Mbps for $35 or 60 Mbps for $ 48. In order to terminate calls, it is best to use the fiber-optic connection as it provides optimal quality of Internet connection and high speed. The Ultra Fibra Optica from CNT will be an excellent choice for a terminator, as well as you should select the speed according to your needs, depending on the amount of traffic you terminate. Please note that for the smooth operation of 1 channel of the gateway requires 42 kbps.